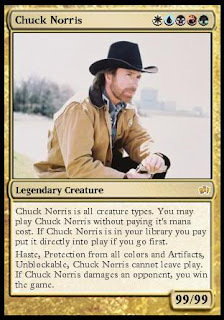 A while ago I had someone pull a Chuck Norris card on me in an online discussion. Putting aside the fact we weren't actually playing Magic: The Gathering, or the fact that Chuck Norris jokes stopped being funny at least ten years ago, I still felt compelled to come up with a win. 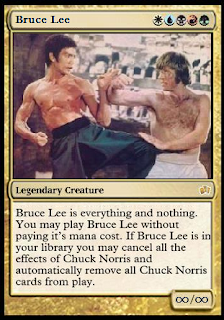 That's when I played my trump card. Feel free to use it in your next match. I'm pretty sure there are no rules against playing random cards you printed on your computer, right guys?